Energy in the US: generation and use | Blah! A few weeks back, I attended a “Summit and Forum” for the Office of Basic Energy Science’s (BES) Energy Frontiers Research Centers (EFRCs), a collection of 46 projects that are aimed at developing the fundamental science that will underpin the energy infrastructure and economy of the future. I am part of one EFRC, the Center for Materials at Irradiation and Mechanical Extremes (CMIME), that is centered at LANL and has the goal of looking at materials under extreme conditions, including those that occur in a nuclear reactor. One thing that I found particularly interesting is summarized by the figure included here, which is an Energy Flow diagram. This particular one, found here and developed at LLNL, is for 2005. The units of energy for each box is in so-called quads, convenient because the total energy produced and used in the US is about 100 quads. What is most striking about this figure is that more than half of the energy produced in the US is actually lost. Not necessarily wasted, as some of it is the inevitable loss due to transmission and other factors. But, much of it is also due to just inefficiencies in our system, in our old grid, and in our poorly designed buildings. For example, we lose a lot of waste heat in industry which, if captured, could be used to power homes and other businesses. Further, our grid is as old as there is in the world (a side-effect of being the first country to develop a grid). China, on the other hand, is developing high voltage state-of-the-art grids that will reduce transmission costs and allow for more efficient use of renewable energy sources. The other thing that jumps out to me is that renewables account for such a small fraction of our energy portfolio that even if we pushed heavily on them, investing significantly more resources, it will still be a long time before they can make a significant dent in our energy use. This is one of the reasons I’m pro-nuclear. I know nuclear has its risks — Fukushima clearly demonstrates that — but it is the only proven non-CO2-emitting energy source we have, the only thing that will help us tackle climate change in the immediate future. This is not to say that renewables aren’t important — indeed I think they are and that they will be a huge part of our energy portfolio in the future — but they are not a short or even intermediate time solution. If we, as a society, want to curb green house gas emitting fossil fuels, nuclear has to be part of the picture. So it seems to me. 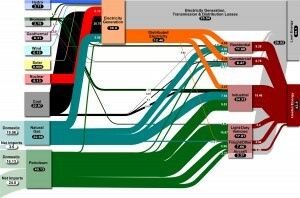 Anyways, this figure gives some food for thought and gives a good overview of how our energy is both generated and used. Very interesting–we talked about how hard it is to do anything under our system of laws. Anything new can be stopped for the price of a postage stamp–and old systems of renewable energy, like dams, are unpopular and at risk. Even modifications with the grid come under attack. At some point politicians need to set some priorities and stick with themor we will become a third world nation.